Test again with 4 axle locomotive. I’m thinking the 4 axle loco will be more forgiving. I need to order some wheels to do this. Switch to flex track. It is easier to lay smooth track with and I’ve successfully tested 24″ radius curves with flex track and 6 axle P:87 locos. RP-25. My 6 axle loco with RP25 wheels works just fine. This wheel isn’t touching the track. More obvious: This wheel isn’t touching the track. 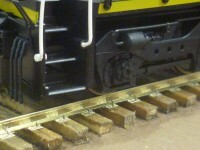 New handlaid section of 24″ radius track. 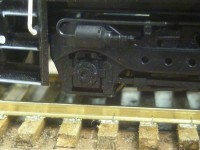 Have you tried the Proto87 Stores Easy Rider suspension stabilizers: http://www.proto87.com/model-railroad-fast-n-easy-riders-working-suspension.html? They’re designed for rolling stock, but can be adapted to locomotives. Is that a Kato SD40-2? 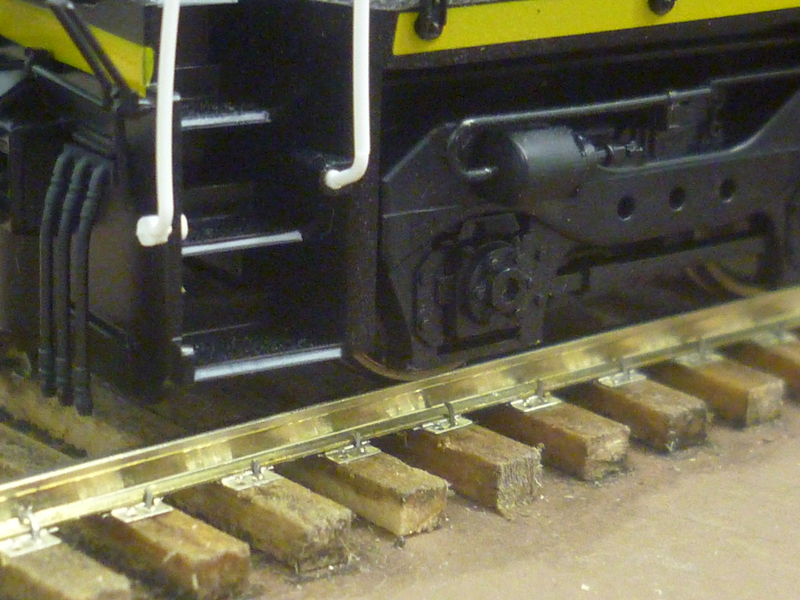 If so, there should be some rockers on either side of the bolster pins that allow the trucks to pivot up and down along the direction of travel, but restrict movement from side to side. Shave these off, then attach the Easy Riders, one pointing in the direction of travel and the other pointing towards the sides. You may need to get a little more creative than this, but it ought to give your locomotives enough flex to deal with small inconsistencies in the track. 1. The major one is steam locomotives: where do I find replacement traction wheels, plus my steam locomotive is European, not American and has wheel size of 1400 scale mm (55.12″)? 2. Another one is similar with European passenger cars having wheel diameter of 980 scale mm (38.58″) and freight cars with 900mm wheels (35.43″) while here in America the wheels are only 36″ and 38″. 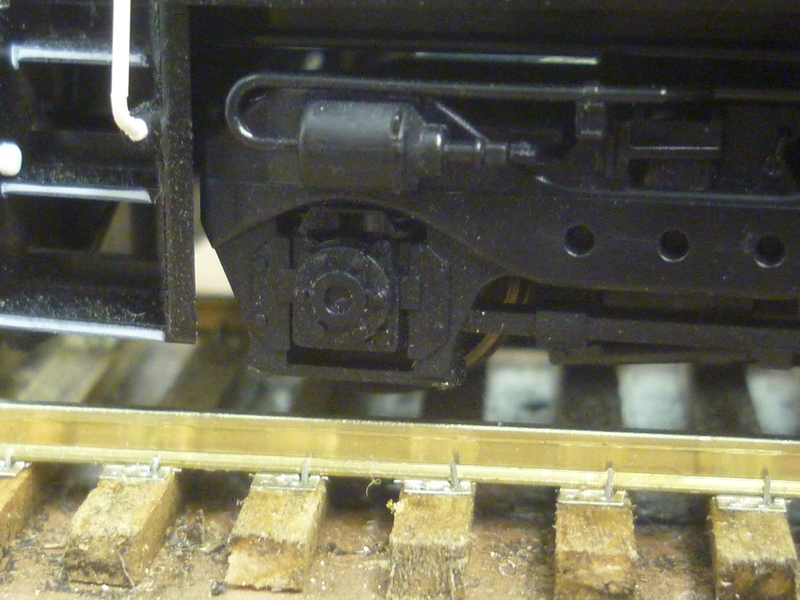 Worse with locomotives, it’s not merely a coupler height issue but gearing. As of six-axle loco derailment issues I would agree with Ian Clasper but add to that. I am not sure about North America, but European minimum acceptable curve radius is 160m, or 500m (72″ in 1:87 scale). However there is one more consideration: buffers. If on S-curve the corner sway of cars exceeds 360mm (the size of buffer plate, the buffers will go past each other) and at the end of curve the train will derail. There is definitely no such problem in North America as trains have no buffers, but going similar radius to this one I guarantee: no derailment would occur on any long rolling stock like Schnabel car or long rigid wheelbase loco, something like DD40x. P.S. 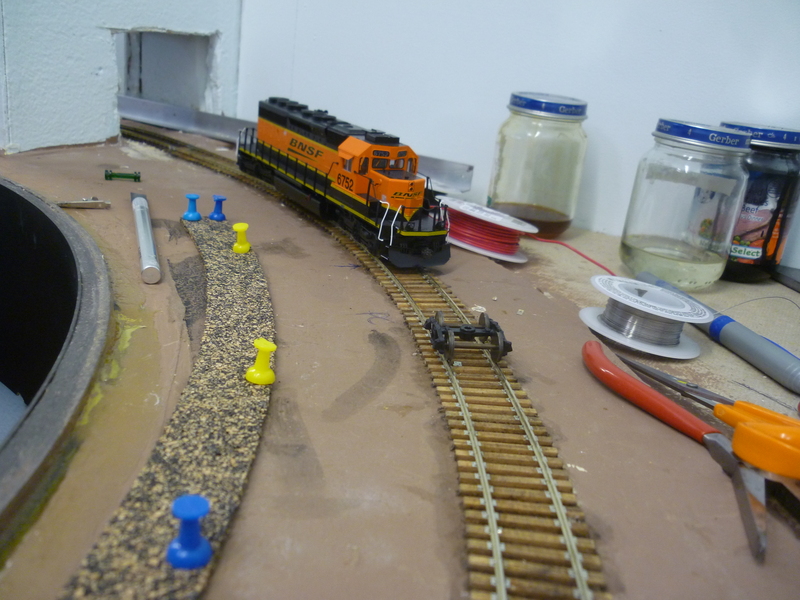 On my layout I use minimum of 75″ mainline curves and planning to increase 36″ to 48″ radius for “non-prototypical turnaround area” to complete the oval in small space. That turnaround area is preceded with easement curve to avoid lateral sway of car corners as my European trains have buffers, but that is unlikely to help with wheelsets where everything is precisely scaled down from a prototype: if the curve is tight for individual truck, its tight despite of all the easements that precede it. The major factor preventing from going to proto 87 though, is I like steam locomotives, maybe someone knows any technique to correct steam loco wheel profile (lathe, etc.)? Have you tried shimming it flat. It would be like the prototype when the re-align a section of track. It could also save you the time of having to re-lay it. You have probably checked this but be sure the wheels are in gauge. Perhaps they have widdened some how. Thanks Ian, good points. I could consider a check rail, but it wouldn’t look too good. I use three point gauges with the single point in to widen (I believe that is the right orientation). I have a good side to side play with the axles, now that I know that is important I’ll keep that ( I was going to try to lessen the swap by fitting some bushings on the end of the axles) thanks for the comments Greg. Thanks Mike, I’m not sure if it’s possible to sand everything too exactingly. I used a sharpening stone (flat and rigid) and checked for discrepancies with a straight edge, but with hand tools, it becomes difficult to tell the differences in height. It only takes a difference of .016″. So better spiking does become crucial. I used Proto:87 stores HO long spikes. These penetrate through the ties and in to the Homasote. This is what is exaggerating the dips. There are short spikes that do not penetrate the ties. I’ve used them and they are hard to work with, but I think they offer a solution. I think sanding carefully done will alleviate a lot of your issues. You should also look at your spiking technique to be sure some of the spikes are not going in to far and pulling your rail down. Perhaps you could create something that would keep you from varying your spike depth. Kind of a jig. Interesting discussion. I am surprised to see such a big gap between wheel and rail. How are you preparing your ties? Definitely getting them flatter will help. Also 24″ is very tight for six-axle units, so if you are able, you should look at getting over 30″ at least. I believe Chuck Johnstone of Calgary was running un-compensated 6-axle diesels through 30″ radius before he tore his layout out to switch to steam. I reached out to Chuck to confirm what I remember… Stay tuned. The second photo of the wheel is after it has kicked out. I layed the ties on Homasote and sanded them to what I thought was pretty flat. The problem came when I spiked stuff in. Spiking every tie to the roadbed really exaggerated any discrepancies in the roadbed or tie height. I think it would run OK with a 4 axle loco, but I really want to run 6 axle. I can run axle easily around a flex track 24″ curve, so I need to be as consistent as flex track or use flex track. It’s amazing that you can get the big power to negotiate those tight curves on flex track! I did check in with Chuck Johnstone, and he was running them through 40″ minimum radius, but felt sure 30″ would be no problem. If you can spare the space, I really encourage you to broaden out the curves. After running it around the 24″ curve several times I do notice that sometimes the wheels do not touch, which is more likely going to be a cause of derailments. I need to try again with a 4 axle loco when I get some wheels for one. Fine scale track requires fine scale suspension. The rigid six wheel trucks will not work on uneven track. You need to either run four wheel trucks, or install springs (at least) over the center axle. And, the bolsters and king pins of the trucks must allow free movement of the truck frame relative to the main underframe. If you run old passenger cars with six wheel trucks, and steam locos with more than two driven axles you’ve already had this problem, even with code 83 and RP25! The width of RP-25 wheels versus P87 would seem to keep equipment on the rails in tighter curves. Seems vertical deviations both parallel and perpendicular to the rails must be kept within the depth of a P87 flange for everything to work properly. Can wood ties be reliably sanded to that level of precision? Interesting. It would seem that the track for proto87 would have to be impeccable. I think I saw something on the Fast Tracks site about a six wheel truck with full suspension. Seems the inflexibility of these trucks is an issue with fine track work.